The exhibition uses a selection of around fifty robots to reflect on the challenges facing humanity with the unstoppable development of these machines and the possibilities they offer to transform the future. Humans have been dreaming of robots (although have not always called them so) at least since the times of Aristotle. The fusion of cybernetics and new mechanics gave a historic boost in these devices in the middle of the 20th century. The real leap forward came with digitalisation and artificial intelligence in the 21st century, years in which we are experiencing deep transformations in all kinds of things. We are thus living in the middle of a robotics boom; these are years in which these machines are transforming us. This exhibition ‘We Robots’ is not only a journey through the milestones in the history of this technology since ancient times until the present, but it also reflects on the challenges that humanity faces before its unstoppable development, and on the possibilities offered by these machines to transform the future. Controlled integration of robots into society will release energy and save resources to better serve people and their needs. This exhibition approaches the phenomenon of robotics through a selection of around fifty robots accompanied by audiovisual elements, models and graphics. Visitors enter into the phenomenon of robotics through pieces such as a human-scale reconstruction of the Mechanical Knight created by Leonardo da Vinci, and original pieces from the end of the 19th century to some of the most emblematic robotic characters from science fiction or examples of the latest humanoids. The exhibition, curated by writer and analyst Andrés Ortega, and organised in collaboration with Casual Robots can be seen on the third floor of Espacio Fundación Telefónica, from 5 October 2018 to 3 February 2019. A fascinating tour based on five themes that explore the origin of robots and their ancestors, their components and types, their uses and functions, the implicit emotions in their relationship with humans, and the fascination exerted for centuries in the field of artistic and literary creation. The idea that machines could do people’s work already existed in antiquity. In this section, among the key exhibits, you can see a reconstruction of the ‘Mechanical Knight’ (1495) by Leonardo da Vinci. It can be considered as the first humanoid due to its remote control potential and anthropomorphism. 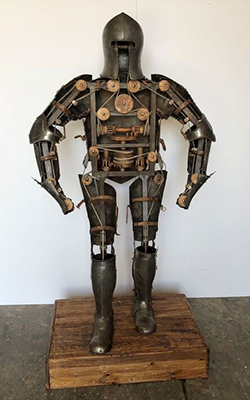 And you can see also an original automaton by Gustave Vichy, ‘The Wizard’ (1890), considered one of the most important 19th century robot manufacturers. InMoov by Gaël Langevin, 2012. 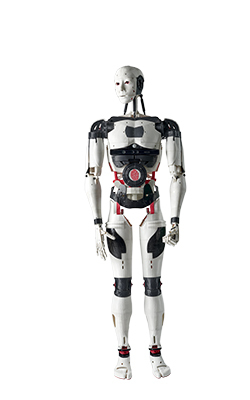 A robot can be defined, according to the ‘Robotics Strategy White Paper‘ of the United States Army from 2009, as “a man-made device capable of sensing, comprehending, and interacting with its environment.” In this section, as starring pieces, visitors can see ‘HR-1’, the Humanoid Robot 1 (2011) from RoboticsLab, Carlos III University of Madrid. Developed by the University, it is exhibited in dissected form to show its essential components and to explain its operation. Also ‘InMoov’ (2012) by Gaël Langevin. The first open source humanoid that can be made at home with 3D printers. Mutual empathy is essential for coexistence and collaboration between humans and robots. So that they serve humans correctly some types of robots must know how to detect their moods and emotions. They must be taught to understand us. In this area, a selection of more than 20 comics and toys (from 1940 until today) are displayed, showing how society’s acceptance of robots has changed. There is also a video installation with images of the most sophisticated humanoids from Professor Hiroshi Ishiguro. The dialogue between science and fiction is one of the most fertile in the history of humanity, and tales with robotic protagonists have for thousands of years fanned the flames of creativity of artists and scientists. The replica of ‘R2-D2’ from the Star Wars saga created in 1977 is a noteworthy part of this section. There is also a replica of the ‘T-800’ robot, protagonist of the Terminator movie from 1984. Although humans must control their development, robots are here to make life easier and achieve things that they themselves cannot. In addition to industrial robots, today we are surrounded by service robotics. Visitors can discover ‘Yume Maru’ (1983) from Taito. A fully functioning predecessor of professional Robotics, this very strange robot was used in department stores to interact with customers. Also ‘PackBot 510’ (2007) from iRobot. This is the standard robot of the army, police and rescue services in the United States, for use in exploration and bomb disposal tasks. It was also used in the natural disaster in Fukushima in Japan. The “We Robots” exhibition is accompanied by a series of workshops organised by our educational team. There are workshops for all ages and registration is free of charge. View all the details here. #RobotMyself, the new competition for Instagramers in which robots are the protagonists.